It helps to think of your home screen as a toolbox. If you were preparing to perform a home repair job, you’d want to be able to find the tools you use the most with a minimal amount of thought and effort. Were your toolbox a disorganized mess, you’d waste valuable time digging around every time you opened it. Your home screen is no different. And unlike iOS, Android doesn’t limit you to a static grid of square icons. You can lay things out in any way that works best for you, employing a mix of app shortcuts, widgets and — critically — blank space. 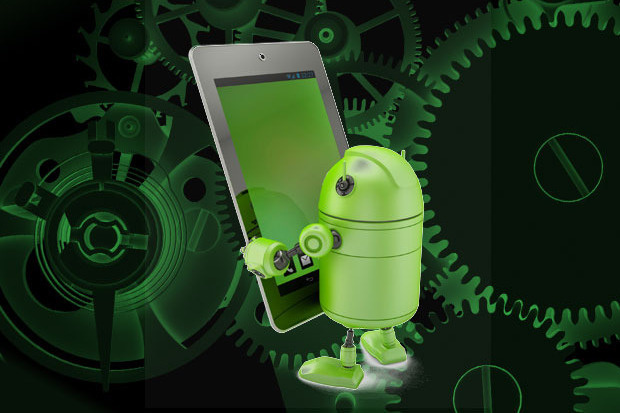 You might also want to include any note-taking apps, music apps, home control apps or photo apps you open regularly. As for everything else, make this your mantra: If you don’t open it almost every day, get it out of your way. Having a ton of app shortcuts on your home screen actually makes it more difficult to find what you want; you’ll be much better served by narrowing it down to a small handful of icons (10 to 15 at most) and then relying on your phone’s alphabetically organized and easily scrollable app drawer when you need anything else. That’ll keep the tools you use the most at your fingertips and make them easy to locate without any visual scanning. You’ll likely even develop muscle memory and start touching the appropriate areas of the screen for different functions without thinking. For types of info that are useful to see at a glance — like weather, for instance — consider a well-placed widget that’ll make that data always available without the need for any additional taps. Just remember: Less is more. If your home screen reaches the point of being jam-packed with superfluous info, it ends up being an ineffective toolbox for your mobile productivity needs. For most people, I’d recommend installing Google’s own Gboard app. (It comes preinstalled as the default keyboard on some devices, but many manufacturers — including Samsung — opt to provide their own inferior alternatives instead.) There are certainly other commendable keyboards out there, but Gboard has grown into the most polished, well-rounded and easy-to-use option, and it comes with some pretty compelling perks. First are the keyboard’s time-saving shortcuts. For instance, you can quickly type a number or special character by holding your finger on the ?123 key in Gboard’s bottom-left corner and then sliding it upward; that’ll cause a selection of symbols to appear, and you can then simply move your finger to whichever one you want. When you need to reposition your cursor, meanwhile, slide your finger along the spacebar — or, for even finer control, tap the menu symbol (>) or the Google “G” in Gboard’s upper-left corner and then tap the “I” that appears within the keyboard’s top bar. (If you don’t see the “I” there, tap the three-dot menu icon within that top bar, then touch and hold the “Text Editing” option and drag it into the main bar area.) That’ll bring up a control panel with buttons for precisely positioning the cursor as well as for selecting text. And speaking of that top-bar menu, that’s where you’ll find some of Gboard’s more advanced features: a search command, which allows you to search Google right from the keyboard and then share items like news, weather and location info directly to any text field; a Google Translate icon, which lets you translate into another language on the fly; and a settings icon, which lets you customize numerous facets of the keyboard — including its height, its visual style and the presence of a dedicated number row. Gboard can also make it less awkward to type on a large-screened device: Just press and hold the comma key and then select the icon that looks like a hand holding a phone. That’ll put the keyboard into a sized-down single-handed mode; you can then position it toward the left or right of the screen or float it manually to any area you like. 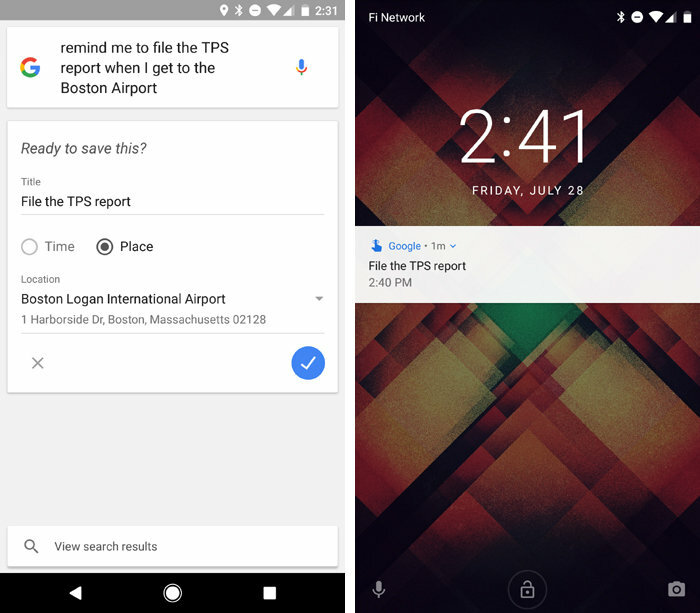 Anytime you need to remember something, no matter how trivial, tell your phone — by either typing or speaking into any search box or Google Assistant prompt. Whichever path you take, simply use the format: “Remind me to [whatever]” — followed by the time or place at which you want to be reminded. 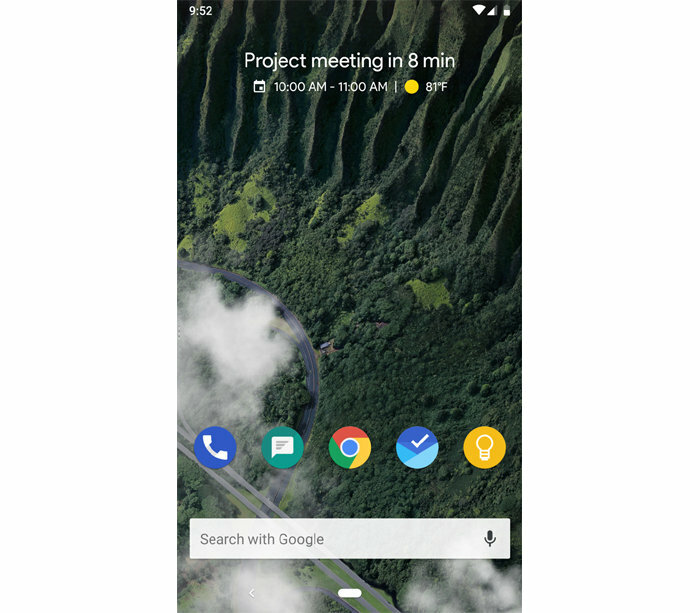 Google’s cross-platform reminder system lets you set and receive location- and time-based reminders. And here’s the really powerful part: Since the reminder system is connected to your Google account and automatically synced everywhere, you can also set and view reminders from a desktop computer (provided you’re signed into the same Google account there, of course). Just type your reminder into the Google search box or directly into the address bar of Chrome, or type “show me my reminders” to see a list of upcoming and past items. Let’s face it: Smartphone notifications aren’t always so smart. Our phones have devolved into constant sources of interruption — and that isn’t exactly conducive to productivity. Take a few minutes to take control of your notifications, however, and they can become genuinely helpful instead of annoying. The first step is to perform a personal notification audit: Over the next few days, carefully consider every notification that shows up on your phone and whether it’s telling you something you need to know immediately — something, in other words, that actually warrants a notification. Odds are, most alerts from social media apps, news apps, shopping apps and other non-essential sources are more distracting than useful, and turning them off will turn your phone into a better business tool. Last but not least, learn to fully utilize Android’s Do Not Disturb feature. Look in the Sound section of your system settings to set up the parameters for how it’ll work, paying close attention to the customizable exceptions. Those allow you to whitelist specific types of alerts — such as phone calls, for example, and perhaps messages from high-priority contacts — and allow those to notify you while all other alerts remain silent. You may also want to set up rules to automatically activate Do Not Disturb during specific times or circumstances (a feature available on Android 6.0 and higher). On the desktop front, power users have long relied on Windows’ Alt-Tab hotkey to toggle between apps without wasting time. As of Android 7.0, Android has a similar option: Double-tap your device’s Overview key (the typically square-shaped icon next to Back and Home), and you’ll snap back and forth between your two most recent processes — no additional action required. If you’re using the new gesture navigation system introduced with Android P, you can flick the Home button to the right to achieve a similar effect. Sometimes, it’s easier to get things accomplished when you can see a pair of complementary items on your screen together — whether it’s a chat window and a browser, a document and a web page or any other work-assisting combination. 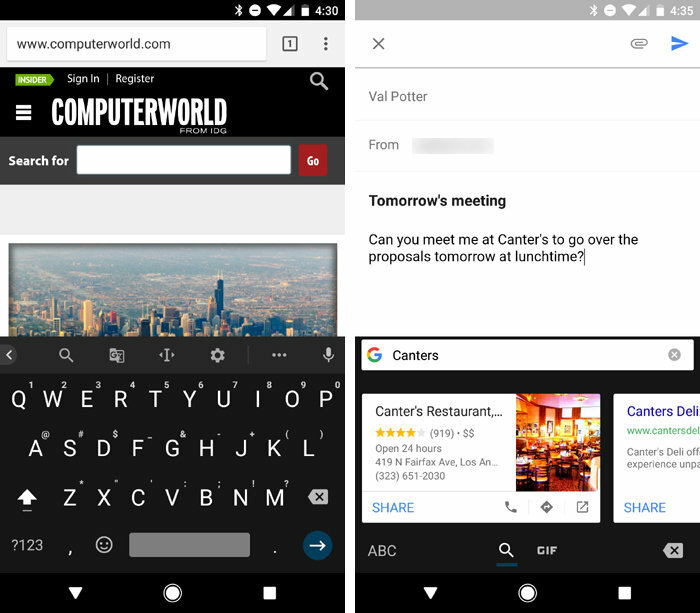 On devices running Android 7.0 or higher, a native split-screen mode makes this level of multitasking possible: With one app actively open, press and hold the Overview key and then select the second app you want from the list. When you’re finished, press and hold the Overview key again to end the split-screen session. On devices using Android P’s new gesture nav setup, the option has moved into the Overview screen: Simply swipe up on the Home button to get there, then tap the icon above any app preview and select “Split screen” from the menu that appears. 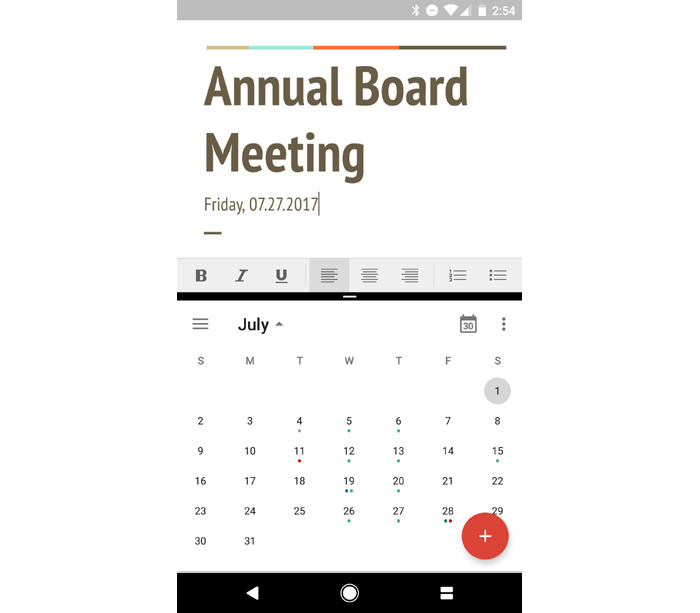 Android’s split-screen function allows you to view two apps at the same time, such as Docs on top and Calendar on the bottom, no matter what size phone you’re using. Google’s Chrome browser can save you serious time by making your mobile work a natural extension of your in-office efforts. The Android app automatically syncs with its desktop equivalent, so all of your bookmarks are always available — and every page you’ve opened from your desktop is easily discoverable in Chrome’s History section on your phone (so long as you’re signed into both places). You can also see what pages are actively open in Chrome on other devices — if, say, you left something open on your desktop and now want to pull it up on your phone — by tapping the “Recent tabs” function in the Android app’s menu. On the desktop side, you can find that same info in the sidebar of the History page. You can install an app that lets you create your own custom gesture shortcuts, for instance, or snag a utility that adds valuable functions into your phone’s fingerprint sensor. I’ve put together a collection of such efficiency-enhancing options. Take a peek — and, in conjunction with the tips above, watch your mobile productivity soar.